E-Force 2010-2011 Camaro SS Competition Kit (Auto Trans)  : Supercharger Superstore, Your Online Source for Vortech Superchargers, Paxton Superchargers, Procharger Superchargers, Magnacharger Superchargers and Techco Superchargers! 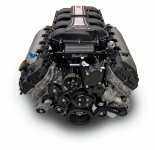 Now you can take an already high performance street car to the next level with an Edelbrock E-Force Supercharger! This supercharger kit is exclusively tailored for the 2010 Camaro SS and will allow you to boost your performance to a whole new level. 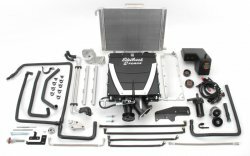 The unique features of this kit are the 12" long intake runners that allow for maximum low end torque and the optional 5 year 100,000 mile warranty. It's compact design fits under the stock hood and compliments the clean look of the engine compartment. This E-Force Competition Supercharger kit is based off of our street supercharger kit #1598, but is paired down to the essential components that a racer needs, without the extras that experienced racers prefer to customize for their own competitive advantage. For competition racing use only. Horsepower and torque data coming soon!